But remember you need to put the files on a web server or a local testserver. The images should have the same domain as your html document. Thank you very much solemone. It was my fault I deleted the other scripts and fogot to check it in firebug. I was missing a function. Thanks again it’s working like a charm! I can’t do it with a background-image. Please help! Thanks a lot… works just great… only one question pls: any ideas on how to make a whole div or ul (multiply images) change all at once, on hover? Local images is fine.But, I’m now trying to use with 500px website images with API and it didn’t work. Unfortunately it doesn’t work with cross domain images. i think the canvas couldn’t do that action.When i look the console , it says insecure to perform that action. Hi Solemone, I’m trying to add this function to to a wordpress theme where img thumbnails for a list of posts or pages are greyscaled. How do I go about using this code with a dynamic img source? It should work. Just change the “src” of the img tag to your dynamic source. Can this be use with jquery lightbox or just with regular images that doesn’t pop out with lightbox.I have jquery lightbox already set up but I am trying to add this hover. I really like the last one number 11 Masking with canvas diagonal from bottom to top diagonal. In addition, I download the demo as well as that software.Also I have an class name image block img for my images, I tried to add .image block img but it just messies my lightbox up. I put .image block img with the script. Maybe you can try to load an iframe with your Lightbox script. In this iframe you call the grayscale script. I forgot to say I am using prettyphoto lightbox, will this iframe/grayscale still work?. Sorry for so many questions but I am new to web. I am researching this now, thanks for responding back so quickly. I think it should. You can also try the “Inline content” method of prettyphoto lightbox. But remember the images should have the same location/domain of the website. Hello, I tried this without the lightbox on an img but nothing works, the demo works just fine but it doesn’t work in google chrome. The demo css. and the other script continues. I don’t see what I am doing wrong. I installed that program, but you don’t need it for the effects to work. I tried it again in the browser without the program with the demo an it still works except for chrome. Finally, also I tried one image with the demo code and nothing happens. How do I do this with prettyphoto “Inline content” method of prettyphoto lightbox as you suggest. I tried researching this but I am at lost right now. I got it to work with prettyphoto without doing the inline content and iframe. I put the js file in its own file and just put the script src=”http://ajax.googleapis.com/ajax/libs/jquery/1.7.0/jquery.min.js”> in the head area but I need to fix my images with the padding and spacing. That’s the css. I didn’t realized that I could do this Thanks for all your help. It works I just have to make the padding and spacing imglist the same as the portfolio area li . I will post and link after I reupload my new site design.Thanks for all your help and this awesome hover effect. Thanks I am going to tried something else, its a beautiful effect though.Thanks for the upload and help. Hi I have a minor issue…My images load up in color, I have to hover each image with mouse in order for the effect to start working properly. Kindly appreciated if you can help to figure this out. I think you have to check the class names in the .load() function. Sorry it was my fault. I set the opacity of the color image to 0 with css. Now I do that in the jQuery code so you can copy it again and it should work. Thanks! I’ven looking for this and finally I found something that works. im trying to use this for a long time but the result is every image display twice, and everything is a mess. in the code i also see 2 div not 1 in every item. i copied the code without changing anything. I am trying to use pagination for this code using ajax But effects after load new images not work. I think you have to call the $(window).load(function()... after your images are loaded. I use .live() and ajaxComplete() but i not get good results. Dude, you are awesome. Thank you, worked a charm on my recent project. Actually… It works but when I tried to view the site on my phone (samsung/android) the images don’t show at all… But when I change .css opacity from 0 to 1 (window load) the images show on my phone…. is there a way around this? tag. You can remove 'absolute', 'opacity' : 0 in the load function. By doing that the grayscale is gone and the full color images are there instead. Thanks anyway. It should work in IE9+ the other IE Versions don’t support the canvas element, that is used for the grayscale conversion. Spend ages working on this one and your article finally got it working for me! The effects are amazing. Thanks for sharing. The grey images are created successfully, but the animation didn’t work. Even if I replace the opacity manually to 1 nothing happens. It should be a css issue, but I can’t figure out what is the problem. I think you have to give the parent div of the images the “position: relative;” property. Hi Its working for images.But i want to entire website into in gray in internet explorer.I need to help on this. This script is for single images only. 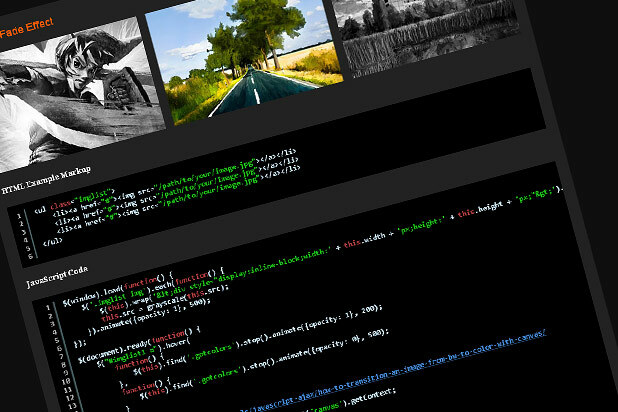 Thera are also new solutions with CSS3 filters. Maybe you can check that out.